It’s official. 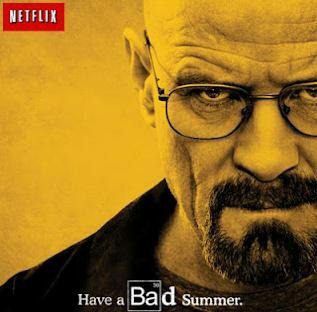 Breaking Bad season 4 is now available on Netflix. Through a post on the Netflix blog today, Netflix announced that season 4 of the critically acclaimed series is now available for streaming . In fact, with the addition of season 4, all four seasons of Breaking Bad are available through Netflix, in both the US and Canada. The fifth season of the series, which is produced by AMC, premiered this evening against the backdrop of an ongoing feud between AMC and DISH Network. DISH dropped AMC from its programming late last month. The two sides even disagree about what the disagreement is about. DISH says it’s about the rise in the fees that AMC wants to charge the satellite TV provider. AMC says they were dropped in retaliation for suing DISH regarding a distribution agreement over another channel that AMC owns. AMC has gone on a marketing spree targeting DISH, as evidenced on their site, where AMC is actively encouraging DISH subscribers to switch to other services. AMC also streamed the premier of Breaking Bad on their site tonight – though they ask viewers of the stream to confirm that they were DISH subscribers. They also asked for name, e-mail address and phone number, and raised a fuss about DISH, before the viewer got to watch the show. Unfortunately, it appears it was a one-time showing and it is no longer available through their site.